The tiny Android-powered console company updated its Kickstarter page with hours left. 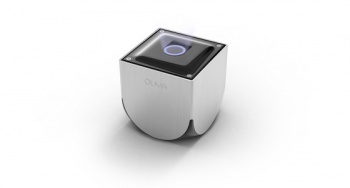 The Ouya made a big splash when the Kickstarter campaign debuted last month. Now that the campaign is winding down with only a scant 12 hours left, the startup led by Julie Uhrman is still working hard to alleviate concerns. The latest update to the Kickstarter page addresses the lack of games for the console, multiple controllers, and additional media center support. In addition to announcing Final Fantasy III earlier, Uhrman said she's in negotiations with many game companies to bring games to the console, but can only confirm one such company as the veteran Japanese developer and publisher Namco-Bandai. That news may draw even more support and push the total funds raised to more than $8 million, but as of press time the total sits at $7,847,892. Namco Bandai Games and Ouya are currently in active discussions to bring some of the world's biggest gaming properties to the exciting new open gaming platform. Namco Bandai brings with it a rich history of iconic gaming franchises, from classics like Pac-Man and Galaga, to seminal franchises like Tekken and Ridge Racer, and we're excited to explore how we can work with Ouya to bring some great titles to the forthcoming console. The graphics power of the Ouya will likely make those classic games work just fine, but I doubt we'll be seeing any of Namco's latest releases such as Soulcalibur V or Dark Souls soon. Still, a console needs Pac-Man on it to be real. While the reward tiers for a console only deliver one controller, the update also announced that the Ouya will support up to four concurrent gamers. You'll have to add $90 to your contribution, but four of those fancy controllers will come in handy if you anticipate playing games that support that kind of multiplayer. Finally, the Ouya Kickstarter page previously announced the Ouya would support XBMC - an open-source application to display media on your TV. Not only is XBMC on board, but Ouya will also support Plex, a competing application that does the same thing. With either of those apps installed on your Ouya, it will become much easier to watch the movies, TV, music and other files available on your home's network. These announcement position the Ouya to be an open-source home entertainment alternative to Microsoft's closed Xbox 360. Naysayers probably still believe the Ouya is more smoke and mirrors than an actual product, but the developments and announcements I've seen so far have been encouraging.